Great Lakes sailing is the ultimate fresh water yachting journey especially if picturesque Mackinac Island is your final destination. The Great Lakes are so large they are really seas rather than lakes. To navigate across these large seas you must have considerable good sailing skills. With Mackinac Island located in the Straits of Mackinac a sailor and boater will encounter strong winds, unpredictable northern Michigan weather plus strong currents due to Lake Michigan and Lake Huron merging together. There are two fantastic Great Lakes sailing events on Mackinac Island in mid-summer each year. The Port Huron, Michigan Bayview Mackinac Race is a historic and beloved sailboat race which has two courses with one being 298 miles long and the other having 235 miles. 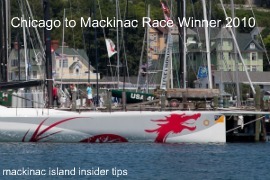 The race begins in Port Huron just north of Detroit and finishes at Mackinac Island. The race is sponsored by the Bayview Yacht Club of Detroit. Sailors as well as non-sailors love to be on the Island at this time to see the magnificent world class boats and to party with the winners! The second Great Lakes sailing race is the Chicago to Mackinac Race that begins from Navy Pier in Chicago and is a 333 mile race to the finish line at Mackinac Island. Both events are held back to back so the sailors can be in both if they want or if they have the stamina. 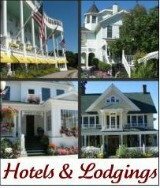 Sailors love Mackinac Island due to its many restaurants, and fun pubs such as the Pink Pony in the Chippewa Hotel, and the great Mackinac Island hotels, and quiet solitude on this magical Island that does not allow automobiles. The Mackinac Island Yacht Club is a popular spot for all boaters to enjoy a drink and even to stay the night if you are a member. 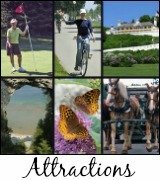 To read about the marina on Mackinac Island click here. The page also provides details about the marinas at St. Ignace and Mackinaw City. 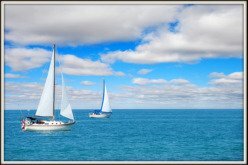 Insider Tip: To read more about sailing on the Great Lakes visit the terrific Great Lakes Destinations marinas website providing detailed marina information all across the 5 Great Lakes. (out on a boat, for example)." Life vest for your Fido! Life Jacket - Polka Dot."